Wigan Warriors will take on Warrington Wolves at this year's Magic Weekend in a one-off kit. The clubs are marking the 30th anniversary of their match in Milwaukee, which Wigan won 12-5, with this year’s kits. A cherry red shirt with a white ‘V’ represents the kit worn for the 1989 friendly which took place in front of a crowd of 17,773. The Wigan team was captained by the legendary Ellery Hanley, also featured names such as Dennis Betts, Andy Gregory and Joe Lydon. The Warrington team that day was captained by Mike Gregory with the likes of Des Drummond, Paul Cullen, Les Boyd and Mark Forster in the side. The design features subtle details to replicate the original with the font of the original collegiate style playing numbers whilst club partners Prestone have agreed to changing their pantone to replicate the original Norweb sponsorship in 1989. There is also a replica of the match logo from the historic game held in the US state of Wisconsin and text at the bottom of the shirt commemorating the 30thanniversary of the game. Both adult and children’s shirts are available to order as of tomorrow, Monday April 15, from the Warriors store in the Grand Arcade and online at https://store.wiganwarriors.com/. Adult shirts are available in sizes Small to 9XL and Ladies shirts in sizes S-XXL priced at £49.99. Junior sizes 5-6 years to 13-14 years at £37.99. 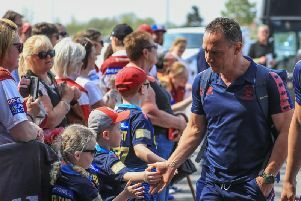 Wigan Warriors face Warrington Wolves in the closing game of day one of Magic Weekend at Liverpoll FC's Anfield on Saturday, May 25.